Voluntary recall since April 2012 due to quality problems with the handle. The only items potentially affected are BABY-SAFE infant carriers sold in Europe between 1 February and 31 March 2012. What is the issue and potential risk? Due to a potential quality issue with a component, the handle of certain BRITAX BABY-SAFE infant carriers can be damaged or, in adverse circumstances, detach, if sudden force is applied to the handle. This can pose a risk of injury to the occupying child especially if it is – against the user instructions - not harnessed. The defect may not be recognised by the consumers instantly. Certain BABY-SAFE infant carriers that were sold in Europe between 1st February and 31st March 2012. Therefore if you purchased your product prior to 1st February or after 31st March 2012, your BABY-SAFE is not affected. Only a small number of potentially affected products are in use with consumers. Please note, the recall only relates to the BABY-SAFE but NOT to the BABY-SAFE plus II or the BABY-SAFE plus SHR II. 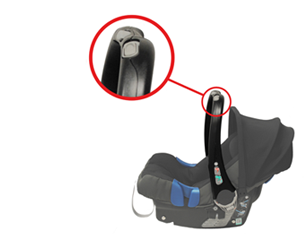 To clearly identify whether your infant carrier is a BABY-SAFE please check if the handle adjustment buttons are located on the pivot point of the handle. There is one on each side. 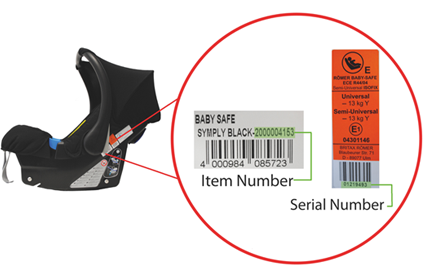 To clearly identify the BRITAX infant carriers that are NOT affected (BABY-SAFE plus II and BABY-SAFE plus SHR II) please note that the handle adjustment buttons on these products are found at the top of the carrying handle. How do I know whether my product is affected? Please contact our customer service about this. You will be asked for the item and serial numbers. 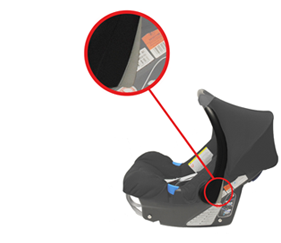 The stickers with the item number and the serial number are located on the left side of the infant carrier (in direction of the occupying child) behind the handle hinge.